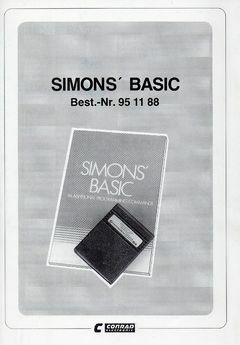 Simons' BASIC is a BASIC Expansion, which was developed by 16-year old pupil David Simons for the C64. It adds 114 new useful commands to the BASIC V2. 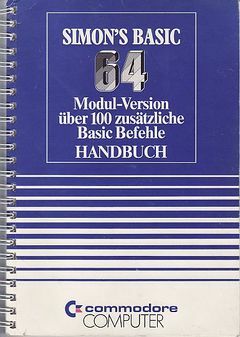 In 1983 it was published by the company D.S. Software in England. Function keys F1 until F16 ! TSB only the memory aeras $C400-$C5FF and $CB00-$CBFF. 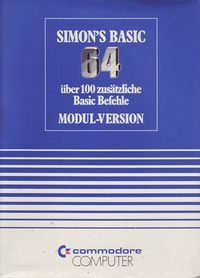 But with Simons Basic still in memory only 30719 BASIC-BYTES remain free and it can be restarted with the key combination RUN/STOP +RESTORE . A few disk versions - but not TSB - crashed by using SYS 64760 or the key combination. 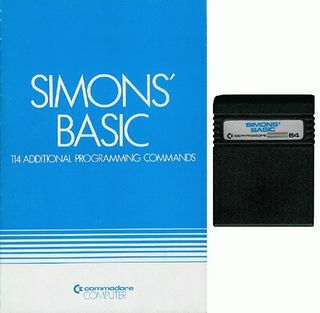 Simons' BASIC Tipps - How can I create self-running Simons Basic programs? 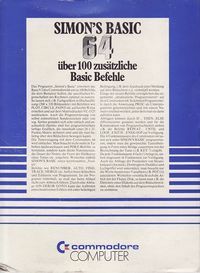 Sternenhimmel - issue 5/85 S.52/S.57 ff. This page was last modified on 23 February 2019, at 18:48.